On this episode of DTB’s “Crazy Tour Stories”, the progressive metal band, Toothgrinder, shares crazy moments from touring, while on tour with Between The Buried And Me, The Contortionist, and Polyphia. On this episode of DTB’s “Dream Tour”, the progressive metal band, Toothgrinder, discusses their ultimate tour lineup, while on tour with Between The Buried And Me. On this episode of DTB’s “First Concert Ever”, the progressive metal band, Toothgrinder, chats about the first concerts they ever went to, while on tour with Between The Buried And Me, The Contortionist, and Polyphia. On this episode of DTB’s “Tour Tips (Top 5)”, the progressive metal band, Toothgrinder, recommends their tips for being on tour, while on tour with Between The Buried And Me, The Contortionist, and Polyphia. Toothgrinder is currently supporting their most recent album, Phantom Amour. On this episode of DTB’s “Tour Pranks”, the progressive metal band, Toothgrinder, reveals the pranks they’ve pulled on tour, while on tour with Between The Buried And Me, The Contortionist, and Polyphia. Toothgrinder is currently supporting their most recent album, Phantom Amour. On this episode of DTB’s “Bus Invaders”, we take you inside the touring vehicle of the progressive metal band, Toothgrinder, while on tour with Between The Buried And Me, The Contortionist, and Polyphia. Toothgrinder is currently supporting their most recent album, Phantom Amour. On this episode of DTB’s “Gear Masters”, Wills Weller, the drummer for the progressive metal band, Toothgrinder, shows off the gear that they use onstage, while on tour with Between The Buried And Me, The Contortionist, and Polyphia. Toothgrinder is best known for their songs “Diamonds For Gold” and “The Hour Angle”. 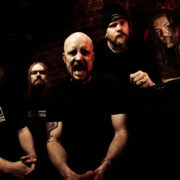 The metal band, Meshuggah, has announced a North American Tour, for January and February. The band is touring in support of their latest album, The Violent Sleep of Reason. Code Orange and Toothgrinder will join the tour, as support. On this episode of DTB’s “Gear Masters”, Jason Goss, the guitarist for the progressive metal band, Toothgrinder, shows off the gear that they use onstage, while on tour with Between The Buried And Me, The Contortionist, and Polyphia. Toothgrinder is best known for their songs “Diamonds For Gold” and “The Hour Angle”. On this episode of DTB’s “Preshow Rituals”, the progressive metal band, Toothgrinder, talks about what they do before taking the stage, while on tour with Between The Buried And Me, The Contortionist, and Polyphia. Toothgrinder is best known for their songs “Diamonds For Gold” and “The Hour Angle”.